As people walk into my home they see a living room full of toys. Everyone comments on how many toys my kids have. Then I have to let them know I have boxes more in the basement and we switch them every month or so. A look of shock is the usual response. My kids have a lot of toys. And every time we go out with them we tend to buy anther two, because we have two kids. So at what point do kids have too many toys? You cannot store them, or put them away because you have run out of room. Your kids only play with the ones on the top of the pile because it is too hard to get to the other toys. You start storing in large tote boxes and don’t know what is in them or worse you have so many cars or dolls they actually fill up a tote box on there own. Cleaning involves moving toys from one area to another and then back again. You pack up 2/3 of the toys and the kids don’t notice. You rotate boxes of toys every few months and the kids think you bought new toys because they don’t remember having them. You buy batteries in the largest packages and still don’t have enough for all the toys that need them. The pile of toys is bigger then your kids, or you. There are so many toys that there is no space to play. At Christmas you ask family and friends for toy storage instead of toys. How do I know this, this is my home, what I live with every day and it is all my own fault. I did not have a lot as a child, I don’t remember ever having more then one or two toys at any point growing up. I tend to overcompensate by making sure my kids have lots of toys. For years I would buy up toys at garage sales, even toys that are for kids way older then mine. I would store them so that I had them when the kids got older. It was great; I could afford lots of toys I could not normally buy. It was fun to go out every weekend and see what we could find. The kids loved it and I don’t think there were many weekends in the summer we would not come home with new toys. Then I had to stop, we just did not need any more toys. The kids still ask if we are going because they live finding treasures as much as I do. Then there are the Birthday, Christmas and oh I just felt like picking this up toys. Then there is the pitfall of; “Hey we are out and the kids have been good let’s go to the store and let them pick something out.” It is so easy to fall into the trap of picking up something new. I makes me feel good as a parent that I can give things to my kids I did not have as a child. However, there is a point when enough is enough, something has to give. A child can only play with so many toys at one time. My solution, reduce the number of toys we buy. Let the kids keep their favorite toys in their rooms and the ones in the living room are boxed up toys and then rotated every few months. When the kids outgrow a toy put it out on Freecycle so some other kid can enjoy it. Is it working, not so well, you see Christmas is coming and we have a large box in the basement that has been slowly filling up all year with toys for Christmas. We just went from buying toys and giving them to the kids right away to “buying them for Christmas”. 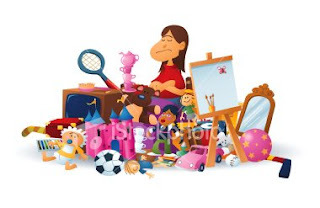 It is hard to say “No” to your kids or walk past a great toy sale when you are battling your own demons from childhood. It is a work in progress and it is going to take sometime, like 20 years, for me to fight the impulse to give my kids what I did not have.